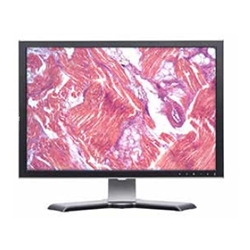 A common question when viewing a microscopy image on a large screen is: What is the total magnification I am viewing on my monitor?" In order to correctly calculate the answer to this question, we must know the answer to the following four questions. What is the microscopes objective's magnification? 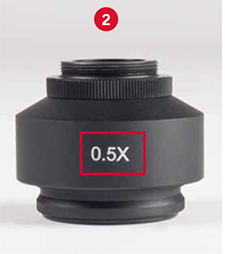 What is the c-mount adapter's magnification? What is the diagonal measurement of the monitor in mm? What is the size of the camera sensor in mm? 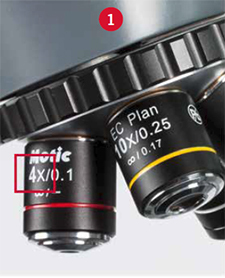 The microscope objective lens magnification is printed on the side of the lens as shown in the image at left (1). If you are using a stereo microscope the objective lens value would be printed on the zoom knob or on the objective turret that is turned to change the microscope magnification. The microscope c-mount adapter (2) is the piece used to connect the microscope and the microscope camera. The c-mount adapter will have a number printed on the side of it. In the image at right, the c-mount adapter has a 0.5x lens built into it. 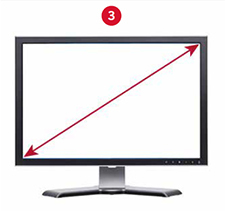 The next number we need to determine is the diagonal measurement of the monitor in mm (3). Typically a monitor's measurement is provided in inches. We will just simply convert the inches measurement to mm. For example, if you are using a 19" monitor, multiply this number by 25.4 to convert it to mm. 19" x 25.4 = 482.6mm diagonal monitor measurement. The final number we will need in order to determine the on-screen magnification is the size of the camera sensor in mm (4). The size of the sensor differs slightly from the size of the chip, so the best way to find this number is to use the chart located below. 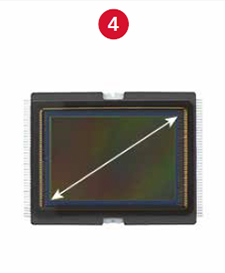 The microscope camera sensor sizes are listed at the top of the chart, and the corresponding diagonal sensor size in mm is shown below. How is optical magnification calculated? This one is fairly simple. Optical Magnification = Objective Magnification x C-Mount Adapter Magnification. If we use our examples shown above from (1) and (2), we would calculate 4 x 0.5x = 2. What about digital magnification, how do we calculate this? Digital Magnification = Screen Size / Sensor Size. If we are using the 19" monitor we mentioned earlier, to convert this to mm we multiple 19 x 25.4 = 482.6mm screen size. For this example, let's say we are using a microscope camera with a 1/2" camera sensor in it. Based on the chart above we would calculate digital magnification by using 482.6mm / 8.00 = 60.325. Now we can find the total on-screen magnification by multiplying optical magnification x digital magnification. In our example 2 x 60.325 = 120.65x on-screen magnification. If you have questions regarding calculating on-screen microscope magnification contact Microscope World and we will be happy to help.